Heeft u nog werk voor Paul Verschragen? Helaas ben ik niet meer werkzaam bij Paul Verschragen. Was voor hem financieel niet haalbaar een leerling te hebben. Ik heb wel nog regelmatig contact met hem; we organiseren 2-maandelijks een lezing over maatwerk/bespoke pakken en shirts in zijn winkel. De eerstvolgende is Donderdag 12 mei, je zou overigens van harte welkom zijn! Unfortunately I am no longer working at Paul Verschragen. It was financially not possible for him to sustain an apprentice. I still speak to him regularly. We organise a bi-monthly seminar about bespoke suits and shirts in his shop. The next one is Thursday the 12th of May, you'd be very welcome btw! Thank you! I went to Beckenstein yesterday and bought a nice piece of worsted pinstripe as Jason suggested. They have a minimum purchase requirement of a yard, so I bought a remnant of what was supposed to have been a pricey fabric. In any event, it feels wonderful. I can cut a couple of strips for practice, and in time, once I have a skirt block, I believe there will be enough left for a skirt, with careful planning. Ooooooooh, that was harsh. I really don't think I deserved that. If I didn't take what was said in this forum seriously, I wouldn't visit so often (in addition to chronic procrastination * ). But opinions and advice do not always align, just like in the real world. One reason I pose questions is because the information I've received is often inconsistent, even contradictory. I know that answers differ based on the context and level of sewing (production, high-end RTW, couture, bespoke tailoring) and that each person has his or her own way of doing things. Which I respect. But as an advanced beginner, I'm just trying to pick my way through the confusion, developing a foundation. Once you know what you're doing and have strong points of reference it's easier to entertain very different approaches to garment construction. Before starting to copy the dress, I showed my visitor the skirts I did in Ladies Tailoring I at FIT, the lined jacket I did in Sewing II (we used fused wool, but still a complex project), the various wool hem finishes and the skirt back with the hand inserted zipper and hand sewn silk charmeuse Hong Kong finished seams I did in Haute Couture Sewing, and the half-lined trousers I did with hand overcast seam allowances and other hand work in Tailoring I. Nice projects all, despite their flaws, which are painfully apparent to me, but I can't wear them because they don't fit. They're cut for industry mannequins. I want to apply what I've learned to clothes I can wear, and keep working on fundamentals so I can get more out of the tailoring classes I take in the future. I also take pride in doing things well. I will never sew at the level and with the speed of an haute couture specialist or a bespoke tailor but I can certainly learn to make beautiful clothes for myself. Is that so wrong? I mentioned to the dressmaker with whom I met today a discussion I read here about the greater attraction of an alterations business to some tailors because it paid better. She agreed; doing alterations is much more lucrative. But it was, she added, sometimes harder because one was working with someone else's design and conditions. It was, she said, like doing a kitchen renovation. I'd rather build the whole house. *I think the "crazy" emoticon is my favorite. **I am a fairly fast writer and typist. I would like to think that my posts and questions are occasionally of interest to people besides myself. I'm quite sure that there are many neophytes who haven't been properly instructed in the basic mechanics of sewing. It's also nice to encounter people in the needle trades who seem interesting and are willing to help passionate amateurs like myself. Edited by tailleuse, 13 May 2011 - 12:48 PM. I might add that doing this simple rub-off was more complex than I ever would have imagined. It was a simple cotton A-line shift dress that I've had for years. It pulls on. The dressmaker showed me how this dress had my body's imprint on it because cotton is a living fabric. I knew that could happen with wool, but cotton? I apparently have somewhat prominent scapulae because she could see the places where the fabric had gently stretched to accommodate them. It was kind of freaky. The realization that people who know sewing, fitting, and anatomy as do professional dressmakers and tailors can see things about me that would be invisible to myself and the casual viewer makes me uncomfortable. So it's pretty unlikely that I'll post any photos in this forum. Not impossible, but not terribly likely. As for my hand stitching exercises, I think I'd be too intimidated. We'll see. Oh, I knew you were just kidding. I've saved all the suggestions people have made to my "Sewing Techniques" notebook in Evernote. Good stuff. Interests:Internet (obvious), movies, sewing, et.al., but these things come and go in their season to return again when the time is ripe. ....opinions and advice do not always align, just like in the real world. One reason I pose questions is because the information I've received is often inconsistent, even contradictory. I know that answers differ based on the context and level of sewing (production, high-end RTW, couture, bespoke tailoring) and that each person has his or her own way of doing things. Which I respect. But as an advanced beginner, I'm just trying to pick my way through the confusion, developing a foundation. Once you know what you're doing and have strong points of reference it's easier to entertain very different approaches to garment construction. Admittedly, I should spend more time sewing than reading about sewing on the Internet** and I intend to do that. I have read through the entire post and 95% of what was asked and answered was something useful. I kept thinking as I read 'That was something I was thinking of asking about' but was too afraid to ask for fear of being told I was wasting someone's valuable time since it was already in a thread somewhere. So I fret (kinda) and read, and re-read so maybe the answers will creep into my noggin while I'm not thinking about it and avoid asking a question. Anyway, I wanted to thank you for being bold enough to ask, and many thanks to all the contributors who answered for your insight. I am a complete tyro, but I hope to learn much. Now I shall go practice. ...I wanted to thank you for being bold enough to ask, and many thanks to all the contributors who answered for your insight. I am a complete tyro, but I hope to learn much. Now I shall go practice. Thanks, John. I've learned that a lot of these skills, even the most fundamental are not intuitive, nor are they taught outside of a tailoring academy or a bespoke establishment. I've also come across contradictory advice. They are not taught at FIT -- some courses have had some hand sewing exercises, and/or involved considerable amounts of hand sewing, but there has never been time to go into it in this much detail. There are too many people. For a Fashion Design student (and I just take evening classes on and off, I'm not in a program), I actually do know a lot more than some people. I was in a crafts seminar recently learning a new technique and I recognized that a sample had catchstitching (cross stitching) and featherstitching; an FIT alumna asked me how I knew some things, I told her about some classes that may not have existed when she attended. I, too, really appreciate the detailed answers that the more experienced forum members have provided. Frankly, I was expecting something on th general order of "Go practice." I didn't realize there was so much I didn't know. Edited by tailleuse, 29 May 2011 - 09:14 PM. I like your signature quote. Hope George is right. I agree that learning to stitch correctly is the foundation. 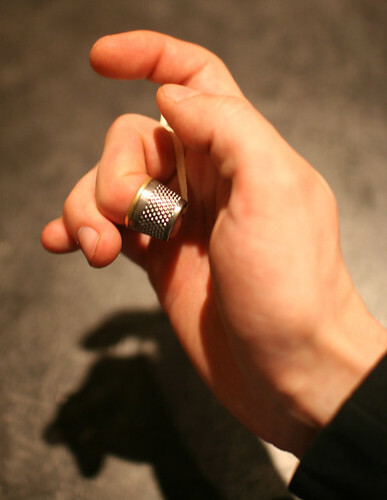 Learn to use a thimble correctly will greatly help you. Practice the stitches correctly even if at slower pace. If you work fast and stitches are not good, then it will be useless to you. Be patient, speed will come with time and experience. A few years ago, I used needles with gold-tipped eyes. I found the threads moved smoothly through and I was able to speed up my stitching time. As you know, in our work, time is money! Thank you. I think I know the brand of needles to which you refer. I've been hearing a lot about japanese hand sewing needles as well. I'm going to pick some up this week. Any recommended brands? There's a place here in NYC where I can get Sashiko needles. Susan Khalje, a Couture Sewing teacher, recommends a particular brand. I've never taken a class with her, but I know people who have and liked her very much. I've never used the Japanese needles on her site, and they are pricey, but maybe they'd be worth checking out. Here's a link. The needles are towards the bottom of the page. I am not certain why you are having difficulty. I had to go sew some linings to see how my hands and fingers coordinated themselves when stitching. When I was sewing in linings, sleeves, etc.., the needle falls into place naturally between my thumb and index finger. Perhaps it is the type of stitch you were performing. It took me longer than two days to perfect my stitches. I would ask Jason, as his ability to describe how to help you with stitching is superior to mine. I've seen a couple discussions on the web involving the use of a piece of cloth tied around the hand and the thimble finger to train the finger to stay in the right position and I believe that alone took at least two weeks. I'd like to try that, but I'd have to have someone watch me. Knowing me, I'd end up crippling myself. I was told of this method when I first began training, but I have never seen this applied. I thought I would be receiving first hand knowledge from the looks of my first sets of stitches while learning. I would be interested to see how this would be done.